Ubuntu 11.10 Oneiric Ocelot is scheduled to arrive on Oct 13, 2011. A lot of things have changed with Ubuntu in the mean time. 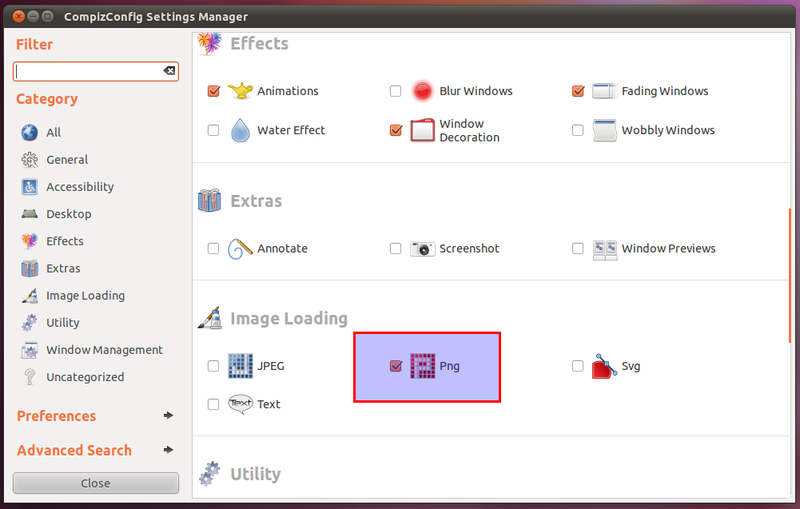 This Ubuntu 11.10 screenshot tour will give you a quick preview of important changes in the upcoming Ubuntu Oneiric release. I have been using Ubuntu 11.10 as my netbook's primary OS ever since the second alpha release of Ubuntu 11.10 happened. Here is a quick list of things to do after installing Ubuntu 11.10. This has become kind of a customary post with every new Ubuntu release. Especially since the arrival of Unity, many new and old Ubuntu users are looking for ways to improve the functionality aspect of Ubuntu and customize the Unity environment to their respective needs. 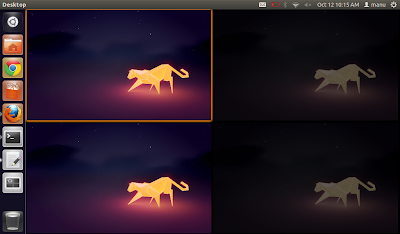 I have been a big time Ubuntu Unity user ever since it was released and here are the things I did to improve Ubuntu 11.10 Oneiric Ocelot after installing it. Note that, many parts of it will inevitably be similar to our previous article on things to do after installing Ubuntu 11.04 Natty Narwhal. There will be many new additional tips and tricks as well. Read on. 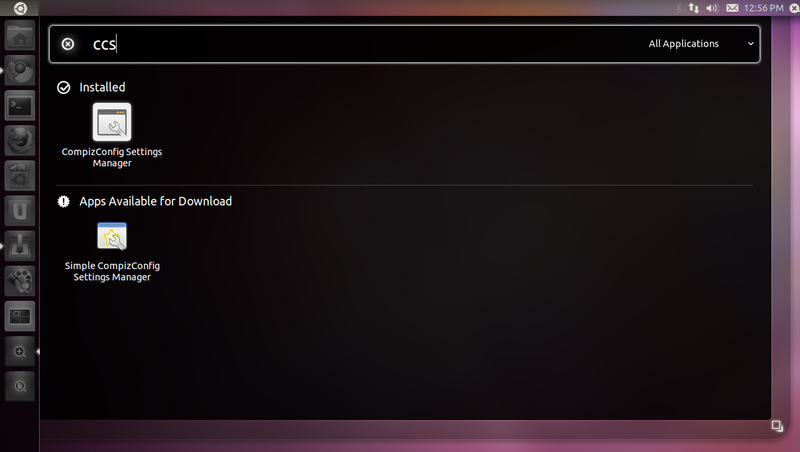 Starting from Ubuntu 11.04 release, you can install restricted codecs package(which include Adobe Flash, MP3 codecs and such) during installation of Ubuntu OS itself. Notice the arrows pointing to the boxes in the screenshot above. 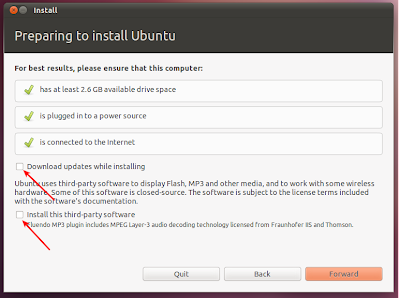 If you tick both of them during the Ubuntu installation process(make sure you are connected to the internet before doing so), restricted extras package will be installed automatically and you will be able to play mp3's and watch flash videos(YouTube videos for example) right after Ubuntu installation is complete. After you install brand new Ubuntu 11.10, the first thing you need to do is to update repositories and make sure you have the latest updates installed(Like I said before, you need to do this only if you haven't ticked the boxes shown in the above screenshot). Open Terminal(Ubuntu 11.10 Keyboard Shortcut: Ctrl + Alt + T) and copy-paste the following command into Terminal. 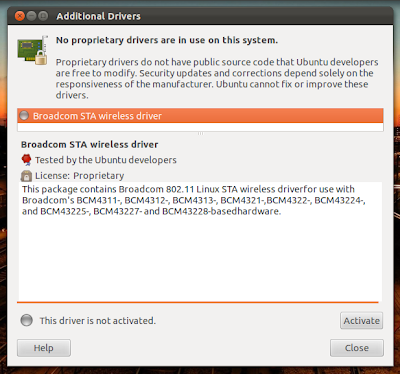 In my case, all the hardware drivers including graphics, sound and wireless drivers were enabled automatically(though, as you can see, I still have a proprietary wireless driver on offer, which I have not activated). But this may not be the case with everyone. 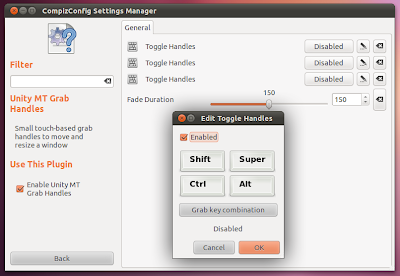 If you are among the not-so-lucky, open Unity dash (Ubuntu 11.10 Keyboard Shortcut: Super key) and search for 'Additional Drivers' application. Done. 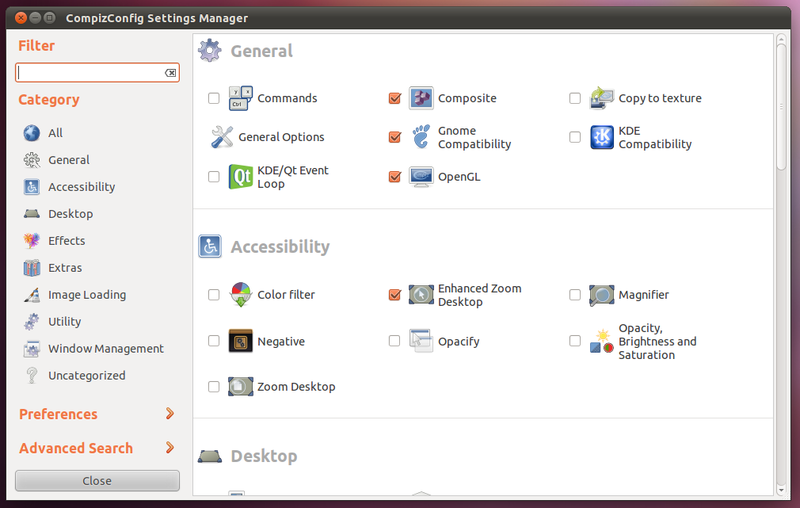 Compiz Config Settings Manager(CCSM) is significant as far as Ubuntu 11.10 Oneiric Ocelot is concerned. We will get to that later on. 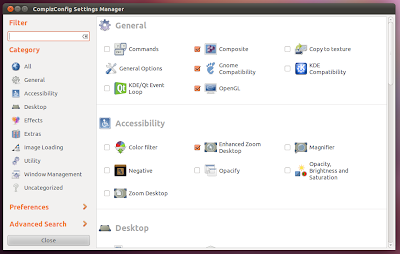 Productivity can be increased significantly in new Ubuntu Unity desktop if you know the essential Unity keyboard and mouse shortcuts. Here are some of the most important among them. Super Key(Windows Key) - Opens dash. Hold Super Key - Invokes Launcher. 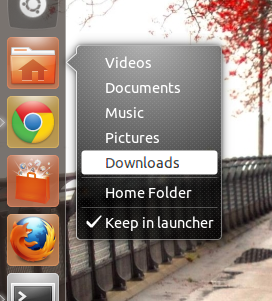 Hold Super Key and hit 1, 2, 3 etc - Open an Application from Launcher. When you hold the Super Key, specific numbers will be displayed in order above each application. 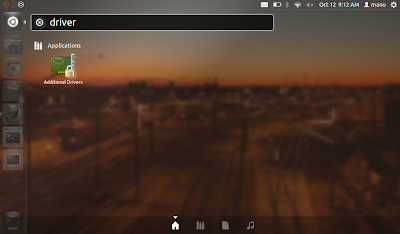 Alt + F1 - Put keyboard focus on the Launcher, use arrow keys to navigate, Enter key launches the application, Right arrow exposes the quicklists if an application has them. Alt + F2 - Opens dash in special mode to run any commands. Super + A - Opens up applications dash. Super + F - Opens up files and folders dash. 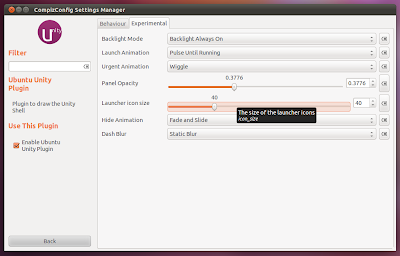 Adjust the value of 'Launcher Icon Size' by simple scrolling. 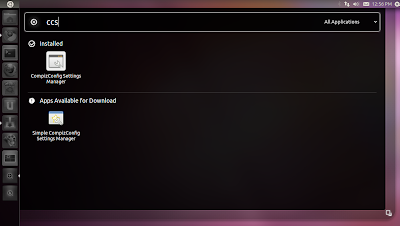 The default value of 'Launcher Icon Size' is 48, but I like it around 40 for my laptop. 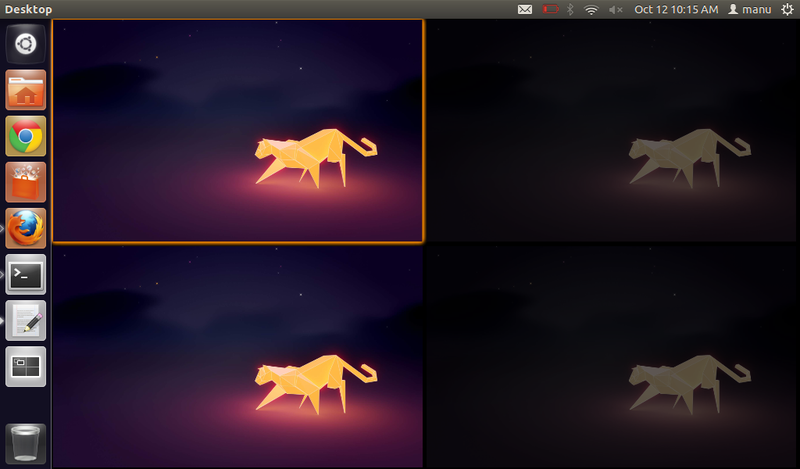 By default, Ubuntu 11.10 Oneiric Ocelot gives you four workspaces to play around. Keyboard shortcut for activating the four workspaces is Super + s. Now, if you want to increase/decrease that number do the following. Quicklists are something that I thought would be included as a default feature in Ubuntu 11.10 Oneiric Ocelot(at least some of them). But that didn't happen. 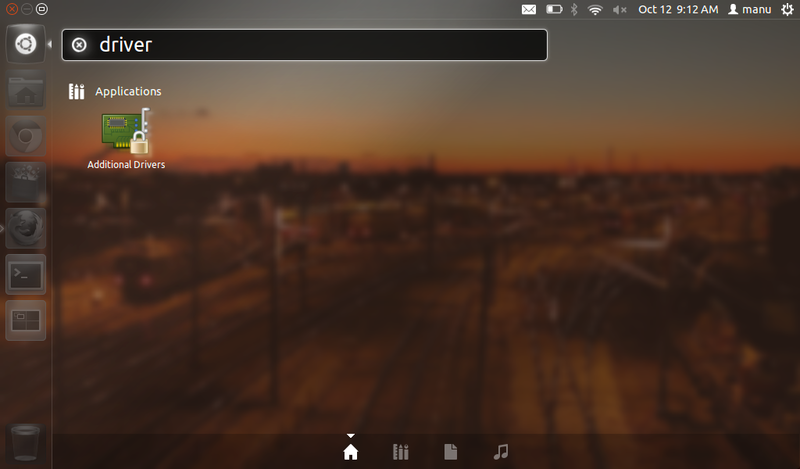 Home Menu quicklist in my opinion, is a must have feature(see screenshot to know how it will look like). Follow the steps to add your favorite places as quicklists. You might want to try other popular quicklists for Ubuntu 11.10 Unity as well. This is another feature that I thought would be included as a default. Unity grab handles are a easy and eyecandy way of resizing windows, better suited for touch screen devices though. Launch CCSM(just search for CCSM in Unity Dash). Make sure that the category Png(highlighted above) is ticked. 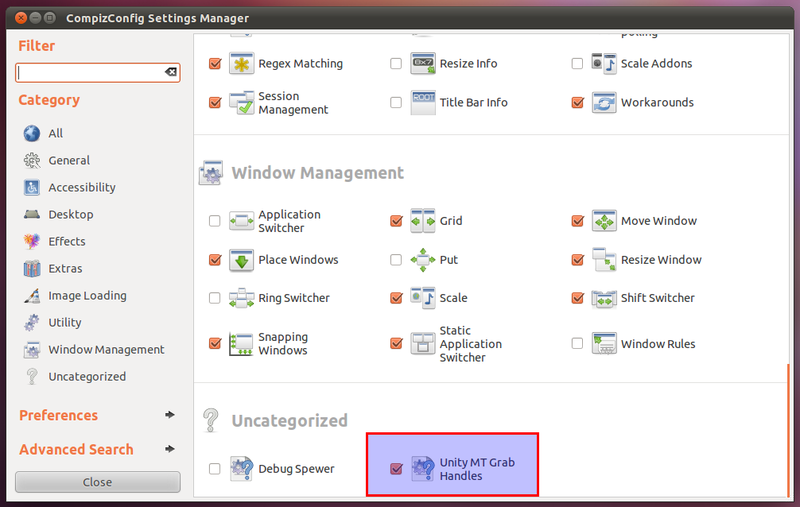 In the Uncategorized section at the bottom of CCSM, make sure that Unity MT Grab Handles is ticked as well. Click on Unity MT Grab Handles option now. You will see that the Toggle Handles option is Disabled by default. Click on the Disabled button and tick the resulting Enabled box. Hit Grab key combination button and select the shortcut you want. As you can see in the screenshot above, Control + Alt + g was my choice. Its up to you. Done. 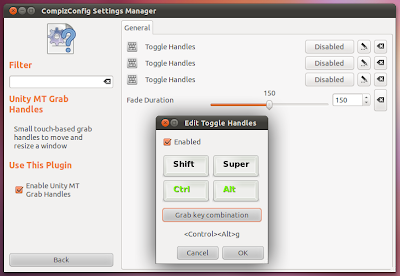 Unity Grab Handles are enabled in Ubuntu 11.10 successfully. 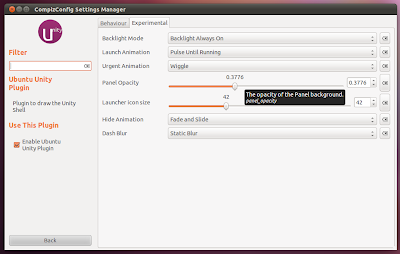 Unity's top panel is locked down and it is not easy to add apps to it anymore. 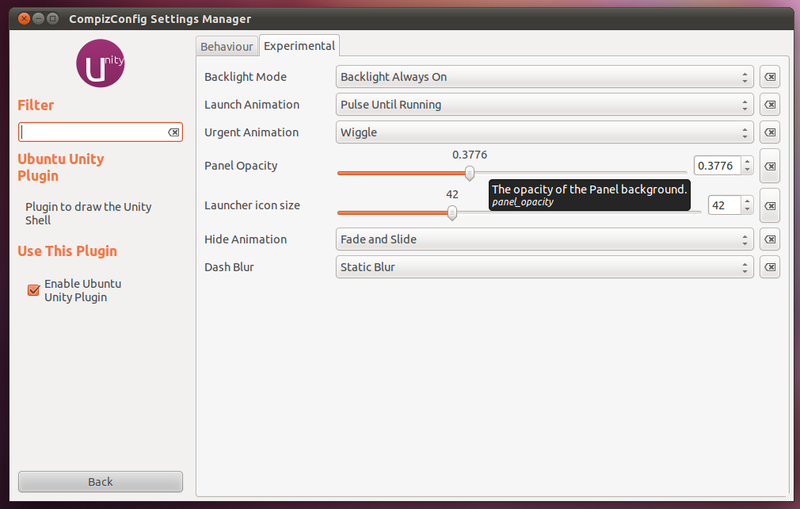 App Indicators are an excellent way to extend the functionality of Unity top panel in Ubuntu Oneiric. And Sysmonitor application indicator is one of my favorite. To install Sysmonitor Indicator in Ubuntu 11.10, you need to copy paste the following commands into Terminal. Done. 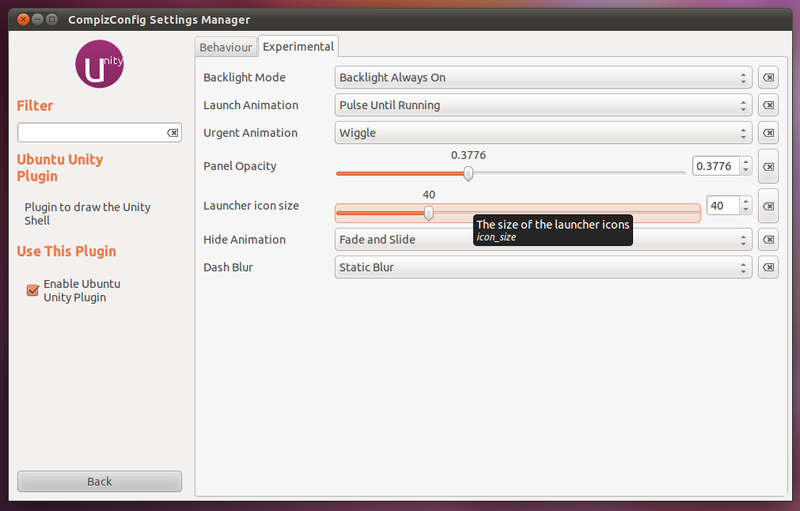 Now, simply launch Sysmonitor Indicator from Unity dash. 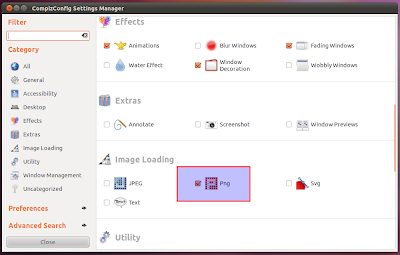 Top 10 Application Indicators for Ubuntu Unity if you need more. 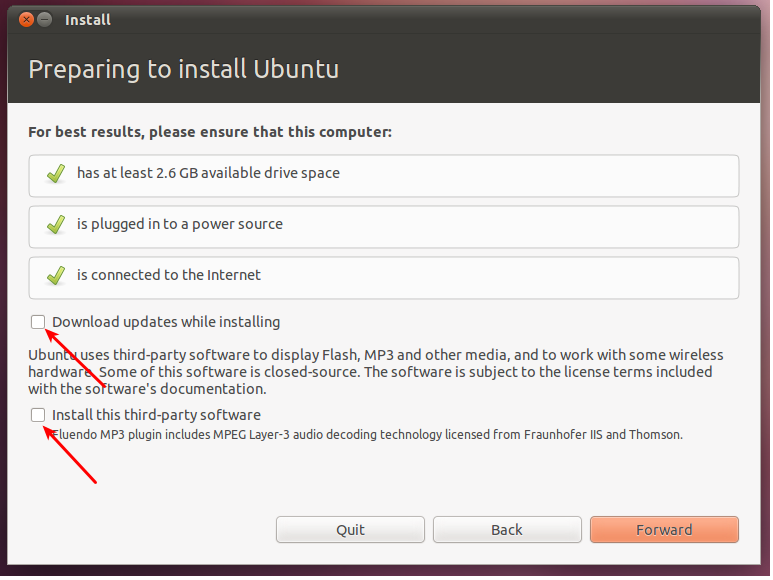 Installing GNOME Shell in Ubuntu is not "mission impossible" anymore. 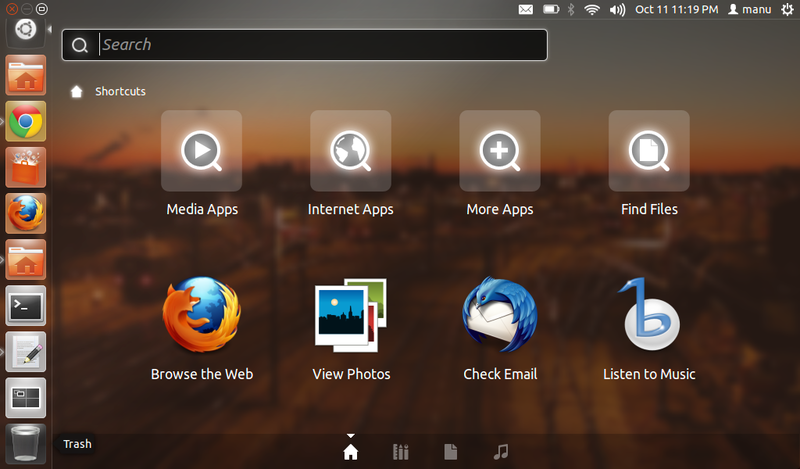 Ubuntu 11.10 Oneiric Ocelot is GNOME 3.0 based and installing GNOME Shell in Oneiric is just a click away. 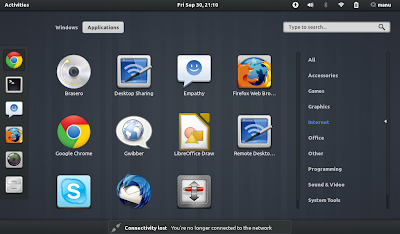 As we noted in our earlier GNOME Shell in Ubuntu 11.10 review, instead of one simple GNOME interface, now you have two, each one unique and special in its own way. Here is how you install it. Just search for 'GNOME Shell' in Software Center OR do the following in Terminal. 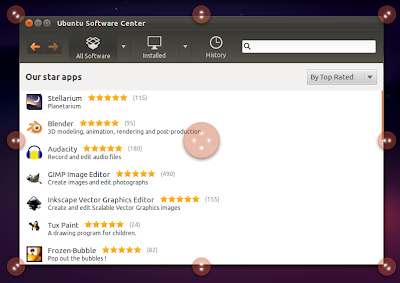 That's it for now, more Ubuntu 11.10 Unity tips and tricks and full fledged reviews are on its way. Thanks for reading.